Renovating your kitchen can take a huge amount of time, money and patience and finding the right materials for this space is one of the biggest challenges you are likely to encounter. Coming up with a kitchen countertop material that is both visually appealing and affordable is a daunting task but once you have made your choice, everything will culminate in fantastic results. There is a wide range of countertop materials available on the current market and one of the best alternatives you may have is the quartz countertop as this worktop surface is durable and low maintenance. 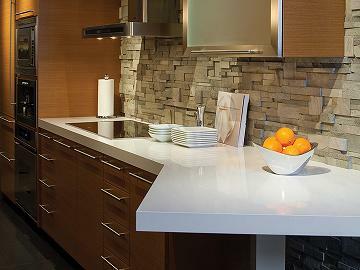 Typically, a quartz countertop is comprised of almost 100% natural quartz and this means that this surface will hold up extremely well under every kitchen condition. However, when looking for a quartz countertop for your kitchen, you should pay attention to the countertops that claim to be made only from quartz as they can contain other materials as well. Keep in mind that any other materials that are used in the manufacturing of a quartz countertop can compromise its integrity thus rendering this surface porous and more vulnerable to scratches and stains. The colors you can see in a quartz countertop are added within the manufacturing process; color pigments are added right to the mixture of ground quartz and bonding agents forming an amazing color palette that can suit any type of kitchen design. When looking for the right quartz countertop for your kitchen, you should take a closer look at its finishes as well in order to go for a highly polished alternative that can match your modern kitchen design or for a textured and stone like effect, if you want a more classic look. Once you decide to spend your money on such a kitchen countertop, you will have to take care of it in order to keeps its original appearance. Even if sealing isn’t required in the case of a quartz countertop, you will have to clean its surface by wiping up any spills as soon as they occur in order to always be on the safest side with your investment. Also, you will have to determine the exact amount of money you are willing to spent on a quartz countertop: for instance, you can expect to spend up to $250/linear foot as the costs are calculated by linear foots. Also, if you are interested for the most sanitary quartz countertop, you should check Silestone’s offer as they have already included the so-called Microban - a special substance that is included on each of their quartz countertops in order to prevent any growth of bacteria and germs. So, if you are truly fed up of the way your kitchen looks right now, you should start by replacing your countertop because this simple action is going a long way when it comes to providing your kitchen space with a brand new, elegant and luxurious appearance.